Happy birthday Sesyle Joslin (What Do You Say, Dear? ), Laurent de Brunhoff (Babar series), Helen Craig (Angelina Ballerina), and Donald Crews (Freight Train). It’s the birth date of Mary Wollstonecraft Shelley (1797-1851), Frankenstein, and John Gunther (1901-1970), Death Be Not Proud. Happy birthday Melbourne, Australia, founded in 1835. Read The Lost Day by Judith Clarke. Thurgood Marshall is confirmed as the first African American Justice of the Supreme Court of the United States on this day in 1967. Read A Picture Book of Thurgood Marshall by David A. Adler, illustrated by Robert Casilla. In 1984 the Space Shuttle Discovery takes off on its maiden voyage. Read Onboard the Space Shuttle by Ray Spangenburg, illustrated by Kit Moser. Her sons called her “Ginnee.” Every now and then, she might be, “Oh, Mom,” but she seemed, even in childhood, their best friend. And because of them, she became the best friend, or author, for millions of boys and girls over the years. Today we celebrate the birthday of an artist who created not only one classic, but two. Born into a cultured family in Newton, Massachusetts, Virginia Lee Burton could draw, write, and dance with equal skill. She favored the latter as a career; in fact, she was headed to New York to pursue that dream when her father broke his leg. She stayed to help him recover, a fortuitous moment for children’s books. Her sons Aris and Michael have always delighted in telling the story of how their parents met. Wanting to take art classes from the renowned sculptor George Demetrios, Ginnee showed up one day at his door. He took one look at this New England beauty—and fainted. Shortly after that, they got married. While working as a newspaper artist, she drafted a book for children, “The Trials and Trails of Jonnifer Lint,” the story of a dust bunny who had some interesting adventures. Editors turned it down in droves, but Lovell Thompson of Houghton Mifflin told her that he loved her drawing and thought she needed to work on finding material that children would enjoy. Ginnee read “Jonnifer Lint” to Aris, who promptly fell asleep. Then she asked herself, “What kinds of books would keep Aris awake?” Well, he liked trains, and snow plows, and steam shovels. By focusing on the needs of her sons, Virginia Lee Burton invented one picture book after another that would keep them, and other children, eagerly following the story. Unfortunately, I never got a chance to meet Virginia Lee Burton, but I spent long and happy hours with her sons Aris and Mike Demetrios. Happy birthday Ginnee—and thank you for your life, your sons, and those incredible books. Originally posted August 30, 2011. Updated for . Thank you so much for the birthday wishes Anita. Hope the power is back on for good. (I love the fact that my birthday is now forever linked to Make Way for Ducklings and the Children’s Book Almanac). I am glad to be the first person (or maybe second, depends whether someone will post before me) to comment on this Life Story – as I never read the book in my life. It may sound strange, but the first time I learned about this book was in the “Coming up Tomorrow” announcement on this site. Yes, yesterday I saw that Life Story would be the book of the day on the Almanac today and I researched it a bit. Wow. What an idea, what an incredible story. This is the first book that I purchased based on a “future recommendation” by the Children’s Book Almanac and Anita Silvey. I didn’t even wait to read your fabulous review today, so I ordered it yesterday. I knew it would be great. This looks like a good book! And one of my favorite picture books gets featured tomorrow! Thanks for sharing Virginia Lee Burton. “Little House” and “Mike Mulligan” are two of my all time favorites. Whenever I see little house that’s a tad neglected or squished between two houses I think of Virginia Lee Burton. Thanks for the book recommendations! 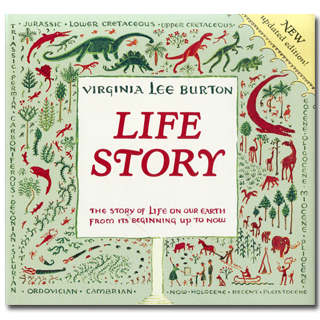 Burton’s Life Story is one of the most memorable books from my early childhood. Rich illustrations, and a unique perspective on the cycle of life. Cheers! ooh, another book to read! I love The Little House, it is one I discovered when I worked for “Big Box” books. This wonderful, wonderful blog is costing me a fortune, money so happily spent. I read the blog, purchase the book (today it was my beloved The Little House) and add to my Grandma’s Library-Gamma’s Liberry in the words of my grandson. Most books take me back to my childhood or to my own children’s, moments to treasure, and the newer books catch me up in the world my grandchildren inhabit. Thank you! Thanks Jane and suzi w. Glad to hear you are celebrating Burton’s birthday with me. I had a record of Mike Mulligan and his Steam Shovel that I listened to over and over again. One of my favorites- thanks for the reminder, and I’ll definitely check out her other books. The house I grew up in is now surrounded by huge homes. To me and my grandchildren who love that house, The Little House has always been particularly poignant.